Combining mathematical models with laboratory experiments and field measurements from a river, an ocean, and a dune field, a team led by University of Pennsylvania geophysicist Douglas J. Jerolmack has found that the same general processes guide the rounding of those diverse particle types. They reported their findings in the journal Science Advances. "We show that wind-blown sand, river pebbles, and wave-worked pebbles all round in the same way by colliding," Jerolmack says. "And, more important, we show how nature selects for the conditions that lead to this universal behavior." The mathematical models explaining the universality of this evolution have been created in recent decades, in the effort to prove the Poincaré conjecture, a major breakthrough in pure mathematics. It turns out that the very same equations have a second, no less interesting interpretation as models for natural shape evolution. Developing this generality about how particles round can help scientists piece together the history of other particles, a strategy Jerolmack and colleagues used to reconstruct the transport history of pebbles on Mars in a 2015 Nature Communications article that affirmed the likelihood of liquid water on that planet. The work may also enable researchers to track the bits of sediment that chip off of larger particles. Small but mighty, these grains build wetlands, floodplains, and beaches, affecting everything from hurricane resiliency to agricultural productivity. The research team, which included Gábor Domokos, a mathematician with Budapest University of Technology and Economics, and Tímea Novák-Szabó, a postdoctoral researcher who has spent time in the labs of both Jerolmack and Domokos, had previously pondered how river rocks rounded. In earlier studies they showed that these particles first become smooth as they bounce down a riverbed, their sharp corners chipping off, and then become smaller as they continue to collide with other particles. 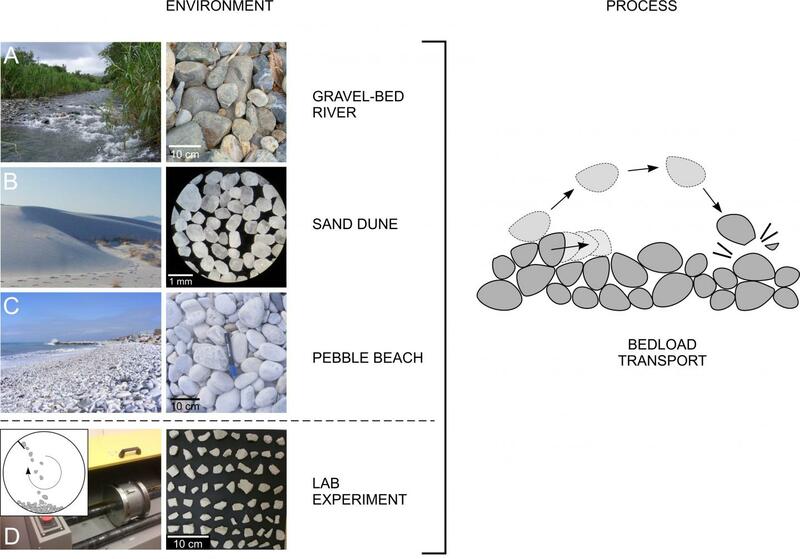 In the new work, they show how simple geometry predicts a common shape evolution for most sediments be they sand grains blown by the wind, limestone blocks colliding in a rotating drum in a laboratory, or pebbles knocked about by ocean waves. Using data sets from New Mexico's White Sands dunes, a Puerto Rican riverbed, an Italian beach, and Domokos' lab, the researchers showed that their premise held true: Collisions with other particles caused all of these particles to round in an identical manner. The similarities arise because of constraints that particles traveling along a bed–whether a river, a dune, or an ocean–share. These particles, the researchers found, tend to originate as elongated shapes, collide with similar-sized particles, and do so with a level of force that favors the chipping off of small fragments of sediment, as opposed to larger forces that might cause a particle to fragment in large pieces, or weak forces that would wear away a surface like sandpaper. With this general rule now in hand, the researchers have the mathematical tools they need to reconstruct the transport history of any particle of sediment based on its shape, improving their ability to predict landscape evolution over time. The work was supported by a Korányi Fellowship, Hungarian OTKA (Grant 119245), and the National Science Foundation Luquillo Critical Zone Observatory (Grant EAR-1331841).